Mr. Gomez was born at his Mother’s Lipan Apache Rancheria known as Tutsande or Big Water People because of the Gulf Coast. He grew up doing ranch and farm migrant work, in areas of Texas, Oklahoma, Arkansas, Illinois, Indiana, Michigan, New Mexico, Arizona, and California. 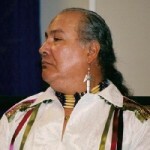 Gregory G. Gomez, President and Co-founder of the Indigenous Institute of the Americas. 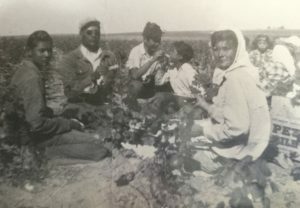 Due to the family’s “nomadic” life style, Mr. Gomez, attended many schools sometimes up to six different ones a year. 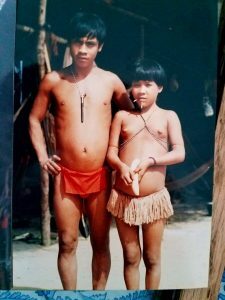 His parents were big on education especially reading and writing so that the children were able to mix, mingle and get along with all sorts of people. He attended Redlands Sr. High, Redlands, Ca. his last three years while he worked with the family. Mr. Gomez served in the Marine Corps from 11/10/65-12/31/68 and covered most of the SE Asian countries during 1967 and 1968. He received his BA degree in 1972 from Southwestern Union College, Keene, Tx. with a Major in Comparative World Religions and Modern Languages, Minor in History of Ancient Civilizations. In 1974, Mr. Gomez was in the first American Indian to graduate from the School of Social Work at UTA, Arlington, TX. His Major was in Administration and Community Organizing. Mr. Gomez arrived in Dallas in 1972 and became involved with the American Indian Center under Director Waunita Elder. Ms. Elder asked Mr. Gomez to help train staff in community outreach and as a common thread in the Indian community, if you volunteer for one job you will end up with twenty. First President and Board Member, Rayford MacIntosh requested Mr. Gomez help fill a vacant Board of Director position which ultimately led to his being elected 3rd President of the American Indian Center from 1973-1975. Mr. Gomez quotes Mr. MacIntosh who always said, ” If you work in the Indian community you have to have the heart of a marshmallow and a hide like an elephant”. In 1975, Mr. Gomez went into Federal Civil service with the US Department of Health and Human Services formerly known as Health and Human Serves, Administration for Children Youth and Families. Mr. Gomez was a Program Specialist, receiving, reviewing, funding and monitoring grants for State, Tribal, University, Youth and Head Start Programs. From 1978 to 1980, Mr. Gomez worked in San Francisco, CA for an Indigenous consultant firm, SVC & Associates where he developed training materials for corporations and the Western Arizona and 23 Nevada Tribal Governments. When Mr. Gomez returned to Dallas in 1980, he returned to Civil service and was asked by the Board of Directors at the Dallas Inter-Tribal center to serve on their board. He served on the Board and was President of DIC for another two years. During that time Mr. Gomez and the DIC helped sponsor Men and Women’s basketball and bowling teams and supported yearly tournaments in the community. There were two Indian centers during that time in Dallas, the Dallas Inter-Tribal Christian Center and the American Indian Center. As part of the American Indian Center, they took young Jr. High and High School students to the Creek Nation Jr. Olympics. From 1983 to 1985 he served as the Executive Director and CEO for Ketchikan Indian Corporation, an Alaska Native Corporation in Alaska. 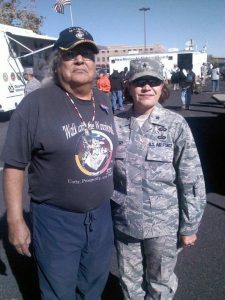 On a personal level in 1997, Mr. Gomez learned he and others of his generation had Post Traumatic Stress Disorder and worked with the Albuquerque VA to develop service for American Indian Veterans through development of a Talking Circle and Sweat Lodge. In addition to the many hours he dedicates to the IIA, Mr. Gomez continues to attend the Talking Circle and Consults with various community organizations and individuals. 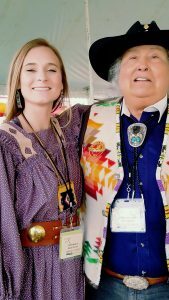 He is a life member of GSUSA and served on the GSUSA National Board of Directors for 6 years, Life member of the American Indian Scouting Association and a Life member of Disabled American Veterans, he was a founder of theTexas Indian Social Workers Assoc. and currently serves on the board fo the Memnosyne Foundation/Institute. Mr. Gomez takes pride in being a direct descendant of Negoyani (Old Man of Wisdom) Mescalero Chief known as “Chief Gomez” in military history who “terrorized the San Anton Rd” between San Antonio and El Paso, Tx. In the 1840’s-1860’s. As he says “How can one be a terrorist when fighting for our land, people and rights against foreign invaders”. He is married to Dr. Cathy Gutierrez Gomez, they have a daughter, son and two grandsons. Mr. Gomez has shared his knowledge in magazines such as the Christian Science Monitor, newspapers The Oklahoman,and films such as The Big City Trail: The Urban Indians of Texas. President, Gregory Gomez working with Native youth about traditional views of healing. In 2016, the IIA launched it’s series, Ask Uncle Gregory. This video effort is a result of Mr. Gomez’s accumulation of nieces and nephews “NDN” way, who are, at times, embarrassed to ask questions or don’t know who to ask about Native culture. In his travels, Mr. Gomez as seen a large number of young and old alike, who do not know their history. We currently “google” & “you tube” to learn about culture and Native youth read books from authors who claim to be experts in Native spirituality yet do not even identify their tribal affiliation. Our culture is passed down from generation to generation making it nearly impossible to convey or define our life-ways between two pieces of cardboard, or in a movie. The Ask Uncle Gregory videos are an attempt to answer basic questions that have been asked of us over the years. It is a unique attempt to educate and relate our culture to the broader society through new technology.